At the end of each year, we take a look back over how well we have lived up to our mission, stayed true to our values, and kept up focus on the guiding principles that inspire and motivate us at Cafe Imports: Quality, Service, Education, and Progress. This year’s Progress Report is condensed into a single analysis of our engagement with our communities, our educational outreach, and our efforts toward the development of ever-better coffee quality. Our focus in 2018 was on creating real, strong relationships with everyone we partner with along the supply chain, and in thinking critically about our position at coffee’s source, as well as in the marketplace where our customers are based. New investments, new social projects, and new ways of thinking about coffee are included in this year’s report, as well as a look forward to another 12 months of caffeinated awesomeness. 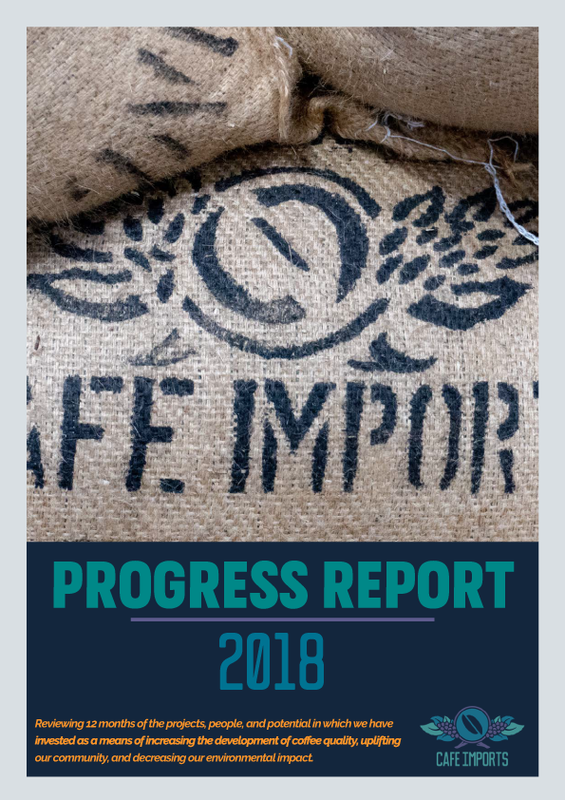 We hope you enjoy this year’s Progress Report and welcome your feedback to progress@cafeimports.com. Click the link below to read about what we got up to in 2018. From a seedling in a nursery bursting out of the earth’s soil to a warm cup welcoming the potential a new day can bring—coffee’s very nature seems to be ingrained with the notion of progress. At Cafe Imports, we take our morning coffee as an important symbol of the work we set out to accomplish throughout every day. As one of our driving principles, we strive to make progress in every aspect of our work: strengthening community, developing quality, and practicing environmental responsibility. Great coffee doesn’t end with the harvest, with the roast, or even with the brew—we recognize that every step along a coffee’s timeline from seed to cup is a sign of its progress, something we try to emulate in the business that we do and the lives that we lead. The demand for quality coffee offers an opportunity to collaborate and create momentum together along the supply chain, from seed to cup. We look forward to discovering where this forward progress will lead, but we are also dedicated to engaging with and enjoying the journey in the meantime. In specialty coffee, we emphasize the impact of terroir in creating the unique, special profiles we find in beautiful coffees, and we speak poetically about the diverse microregions in which those coffees are nurtured and grow. An equally—if not more—important view of terroir is as the communities involved in coffee’s cultivation, and the people and processes which preserve the beans’ quality at every point of production. High-quality coffee is a representation of the hard work and dedication of the growers, farmers, pickers, millers, exporters, and importers involved, as well as the people who support and sound those various contributors and their contributions. We believe there is a synergistic relationship between coffee, community, and progress: It can take an entire community to progress in producing coffee, and coffee can create progress for a community. While we believe this philosophy to be true with most coffee grown worldwide, Cafe Imports has developed and continues to seek community-driven programs on which we can collaborate with our producing partners, designed to support and contribute local initiatives within a myriad of coffee-growing communities. Coffee itself is a long-term investment for a farmer: It can take up to five years for a new coffee plant to bear fruit, and it can take most of a lifetime to learn how best to care for those plants, and how to tend to the fruit and seeds they produce. At Cafe Imports, we believe that these investments are best made in partnership, and that by learning and growing together with our producing partners and customers, and by digging in and making long-term investments with them as a buyer for their coffees, we have the potential not only to find, but in many cases to help develop the finest coffees in the world. Our goal is to be able to identify potential in coffees and in coffee growers, to pay the right price to ensure that quality is rewarded and sustained—and, in many cases, improved. That also means that the investment needs to be more than simply an exchange of money for goods: It’s an exchange of ideas, of trust, of resources, and of understanding. We are proud of the quality incentives, educational initiatives, and health and financial projects we’ve been able to back with our producing partners, and we look forward to tasting the fruits of all of this collaborative labor for many years to come. At Cafe Imports, we strongly believe in social, economic, and environmental responsibility. With that responsibility comes the realization that we cannot save the world, but we can make every attempt to improve it through our global business actions. For us, this means promoting social programs at origin; paying premiums and providing financing to our producer partners; and minimizing the environmental impact of our daily operations. We use the word “Progress” because it implies an evolution and movement forward. In terms of our environmental progress, our goal each year is to examine what we have accomplished and look for new ways we can minimize our global impact. As a specialty-coffee importer, we realize that the foundation of our business relies heavily on travel and coffee transport. We know that the transportation industry accounts for nearly 30 percent of global greenhouse gas emissions. We know that the production of electricity to power our four offices on four continents has a significant environmental impact. We know that 43 people driving to work, 20 miles per day puts carbon monoxide in the atmosphere. So we have large polluters like extensive global travel, ocean cargo, and trucks and trains to bring our coffee from one end of the earth to the other. We also have less-substantial polluters like utilities, employee commutes, and garbage services. Once we begin to examine these footprints individually, we are able to assign value to them in terms of their carbon output. Only then can we begin to calculate the costs and effort necessary to offset them completely.